Come early to the popular semi-annual Japanese feast and eat, eat, eat! VJLS & JH volunteers work feverishly over many days to make and serve a wide variety of menu items, hot, fresh, seasonal and affordable. This fundraising event is always popular, with children’s games corner, door and raffl e prizes, and a silent auction. 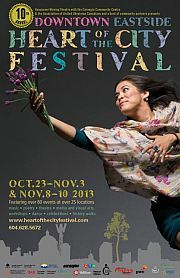 At 1pm, for a spicy Heart of the City Festival treat, Sansho Daiko will perform. Formed in 2010 Sansho Daiko is a Vancouver-based taiko group that draws on both traditional and contemporary repertoire, and creates a powerful and joyous sound that resonates long after the last beat has been played….Entrance to the Bazaar is by donation.